The last thing you want to hear when you set out to mow your lawn is knocking from your engine. A number of things ranging from low engine oil and bad gas to a loose or unseated blade can cause your mower's engine to knock. Because of this, you may take a little while to pinpoint the exact cause. Fortunately, most of the issues that can cause your engine to knock are fairly easy to correct once you have located the problem. Allow your engine to cool if you have been using the mower. Once it is cool, or if you are starting it cold, remove the oil fill cap dipstick. Wipe it clean with an old rag, place it back in then pull it out to read it. If the oil level is low, add more oil. Low engine oil level is the main cause of engine knocking on mowers. Remove the gas cap and lean the mower over on its side and pour the old gas into a drip pan. Fill the tank with fresh gas and replace the cap. Old gas can also cause knocks in your mower engine. Remove the wing nut that holds the air filter cover in place and remove the top half of the cover. Pull the foam air filter out, rinse if with gas and then wring it out. Place it back into the filter housing, then replace the top cover and wing nut. Start your mower to see if the problem persists. If it does not, you have solved the problem. If it still knocks move on to the next step. Turn your mower on its side so you can access the blade underneath the deck. Check first to be sure the retaining nut is tight. If it isn't, tighten it. If it is tight, but your blade looks slightly off kilter, remove the retaining nut with your socket set, pull the blade off and then re-seat it onto the shaft. Tighten the retaining nut. If your mower has suddenly started knocking after you have recently removed the blade, this is more than likely the problem. Remove the old spark plug with a spark plug wrench and put a new plug in. 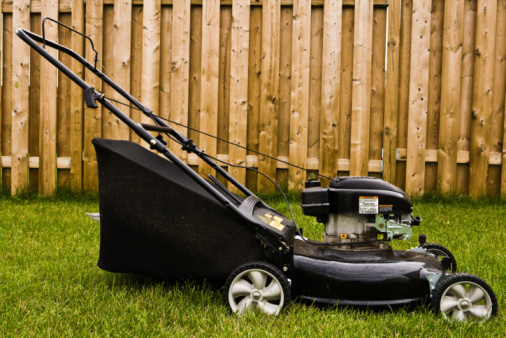 If the problem still persists after these steps, take your mower to a certified mechanic. Ashton Daigle, a New Orleans native, graduated from Southeastern Louisiana University in 1998 and went straight to work as a journalist. In 2005 he tackled the biggest news story of his life - Hurricane Katrina. Daigle is writing a collection of essays: What It Means to be a Saints Fan.